Objectives: Attachment to the fetus is formed before the birth and stronger prenatal maternal-fetal attachment is related to more desirable prenatal and postpartum behaviors and cares as well as better acceptance of the parenting role. Therefore, this study aimed to determine maternal-fetal attachment and its socio-demographic determinants among women with an unplanned pregnancy. 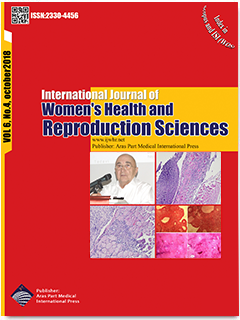 Materials and Methods: This descriptive-analytical and cross-sectional study was conducted on a convenience sample of 200 women with unplanned pregnancies attending the maternity clinic of Alavi hospital (Ardebil, Iran) during 2016-2017. To collect the data, a socio-demographic questionnaire and the maternal-fetal attachment scale (MFAS) were completed through the interviews. Data were analyzed using independent t tests, one-way ANOVA, and the general linear model. Results: The mean (standard deviation) of maternal-fetal attachment score in women with an unplanned pregnancy was 79.2 (11.2) ranging from 23 to 115. The mean attachment score was significantly higher in women with a mistimed pregnancy [83.5 (9.0)] than in those with an unwanted pregnancy [72.9 (11.0)]. The highest and lowest mean scores were observed in the “interaction with the fetus” [14.2 (3.3)] and the “role-taking” [9.2 (3.0)] sub-domains, respectively. Based on the general linear model, only the type of unplanned pregnancy (mistimed or unwanted) indicated a significant relationship with maternal-fetal attachment (P < 0.001). Conclusions:Based on the results, the type of unplanned pregnancy had a significant association with maternal-fetal attachment. Moreover, mothers with unwanted pregnancies needed greater counseling and support compared to those with mistimed pregnancies.